Just imagine the world after 20 years! These can successfully transmit electricity through a 10 centimeter-thick concrete block. 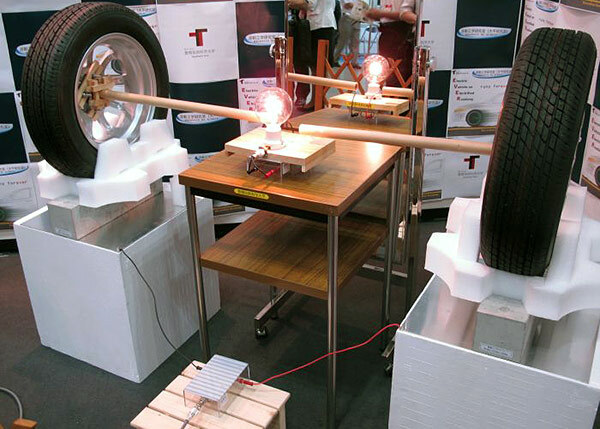 During a demonstration in Yokohama, Japan, the team sent between 50 and 60 watts of power through a pair of concrete blocks to two tires, which then juiced up a light bulb (you can see the rig just above). The project is called EVER (Electric Vehicle on Electrified Roadway), and could someday be used to keep cars moving along a highway without any need to pull over for a recharge, thanks to a constant stream of electricity coming from below the road. There are some serious obstacles to overcome before EVER can get some wheels turning — namely, a need to pump nearly 100 times the current maximum load through concrete that’s twice as thick as what they’ve managed today, not to mention improving undisclosed efficiency levels. Source: Yokohama institute of tech.